How will the NFD teams fare this week? Check out our betting preview for gameweek 9! Ubuntu Cape Town have collected only four points so far in the season and they are without a single win in eight outings, scoring only five goals and conceding nine. They have lost their last three games and they anchor the NFD table. Fellow strugglers, Richards Bay, are just second from the bottom, having registered only one win so far in the current campaign. They have managed to recently hold two good opponents in the shape of Uthongathi and Stellenbosch to goalless stalemates. Both teams have been poor but I’m leaning towards the visitors at 18/10. After remaining winless since the opening day, Leopards managed to claim their second victory of the season last week, unexpectedly stunning University of Pretoria 1-0 away from home. The result which laughs in the face of logic has lifted them out of the relegation zone and into 10th place. Highlands Park are placed fourth in the standings and they’re undefeated in their last three outings. The Lions of the North have, however, lost three and drawn one of their eight games in the current campaign. This will be a tough one to call so I’ll back Highlands Park on the Win/Draw Double Chance at 5/10. High-flying Mbombela are tied on points with top-placed Stellenbosch and they have won five of their eight opening fixtures. They head into this encounter off the back of two back-to-back wins. They need to sort out their defensive frailties as they’ve let in nine goals in eight games. Fellow Mpumalanga rivals, Witbank Spurs, have had a stuttering start to the season with four draws, two wins and two defeats. Their second win of the season came last week and they had not won a single game since the opening day. Get on high-flying Mbombela to win. 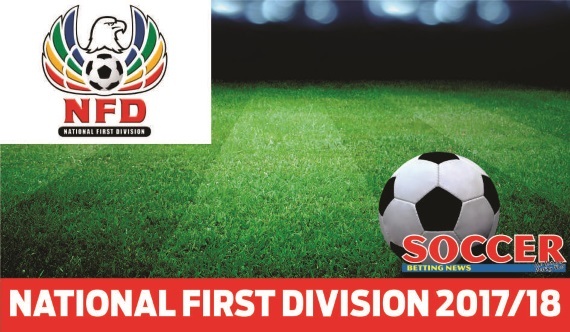 Just when everyone thought Royal Eagles have turned the corner, they were edged by Mbombela 2-1 in their recent match which put an end to their three-match unbeaten run. It’s a defeat they can take though since they were playing away from home against one of the leading sides. Cape Town All Stars have been very inconsistent and they take into this game a record of three wins, three defeats and two draws. You just don’t know what to expect from them. I’m expecting Royal eagles to triumph. The “Real Kings of NFD draws” were beaten 2-1 by Jomo Cosmos last week. That was the first time they conceded more than once in a game. Their conservative tactical approach is clearly epitomised by eight points after an equal number of games. They normally play not to lose. Mthatha bucks have won three and drawn three of their opening eight fixtures, only tasting defeat twice. Their hard-fought 2-1 victory over Cape Town All Stars last week saw them climb up to fifth on the log. I say Mthatha Bucks win this one. This is an enticing top of the table clash with first taking on third. After going seven games unbeaten, Stellenbosch were handed their first loss of the season last week, inexplicably suffering a 1-0 defeat at the hands of Tshakhuma. University of Pretoria slid down one place to third after losing at home 1-0 to Black Leopards. Shaun Bartlett’s men had not tasted defeat in five outings which include four wins on the bounce. Tight encounter but I foresee the Stellies edging it. Super Eagles haven’t really found their feet in the second tier of South African football. They’ve only registered two victories so far and last week they were thumped 3-0 by Highlands Park. Jomo Cosmos lie sixth on the log and with an experienced coach in the promotion battle, they pose a serious threat to the front runners. Last week they returned to winning ways with an impressive 2-1 victory over a defensively resolute Real Kings. They are the first team to score more than once against the KZN outfit. My money is on Cosmos. Uthongathi are unbeaten in their last three games and they’re 11th on the standings with 10 points in 10 games. The Cane Cutters were held to a 1-1 draw by Richards Bay in the KZN derby last week. Tshakhuma stunned the whole nation this past weekend when they handed top-placed Stellenbosch their first defeat of the season. The Limpopo-based outfit has three wins in eight games and they lie eighth on the log. My money is on Uthongathi to win at home.